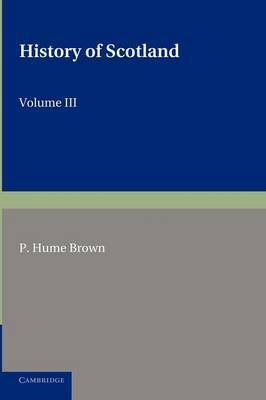 Peter Hume Brown's History of Scotland was first issued by the Cambridge University Press in three successive volumes from 1898 to 1909. These volumes were published in a new edition in 1911, the version which is reprinted here, which introduced some corrections as well as an additional chapter on the development of politics, education, and religion in Scotland during the last half of the nineteenth century. Taken together, Hume Brown's study provides a far-reaching, coherent narrative of Scotland's history, from the Roman occupation of North Britain in the first century to the changes and events that brought the nation into the twentieth century. This is the third volume of History of Scotland. It covers the period from the end of the Glorious Revolution in 1689 to the year 1910.